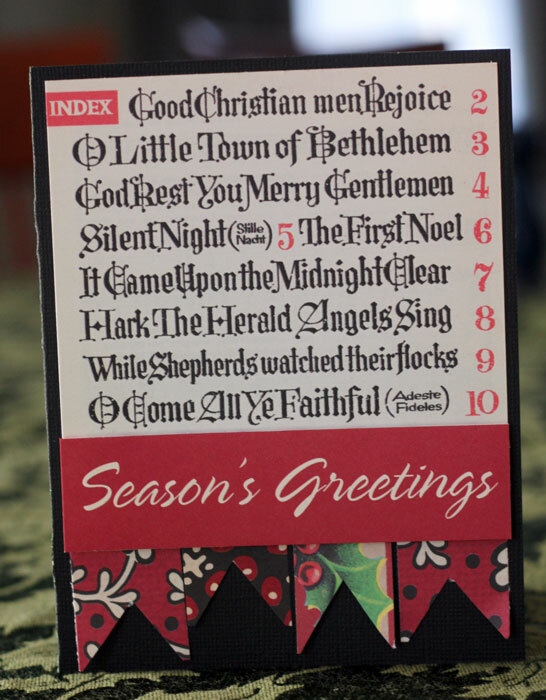 Jenni Bowlin released a mini line for Christmas 2011 consisting of five double-sided, 12x12 themed papers. The huge thing (for me) about this line is that they are cardstock weight papers. I love that! Another bonus about these papers is that coordinate with older lines and embellishments. A new feature of this mini line is the accessory sheet - one side is patterned paper and the other a combination of vintage Christmas tags and strips of patterned paper. The card makers or mini-patterned paper lovers will not be disappointed - each of the 6 paper patterns are included in one sheet of 12x12 paper (in 4 inch squares). There's a lot to like about this mini collection. I love the fact that they coordinate with older Jenni papers. 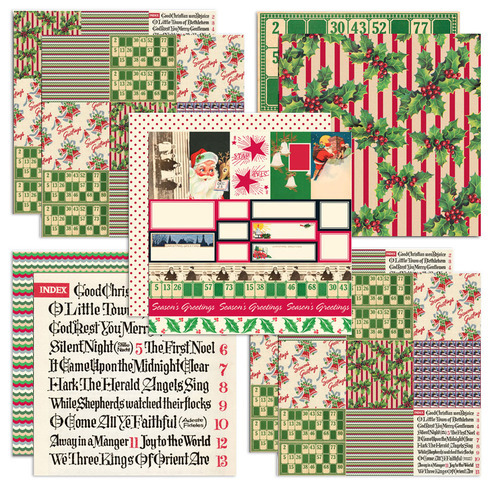 The heavier-weight cardstock is something I have been wishing for, and I've very taken with the adorable Santa and other vintage images on the accessory sheet. It was all very easy to use, even for this simple, non-vintage scrapper! I generally have a tough time with larger scale patterns - the mini sheets are so helpful here. 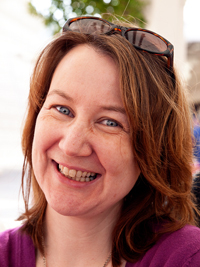 My only other gripe is that I'd like to have more! 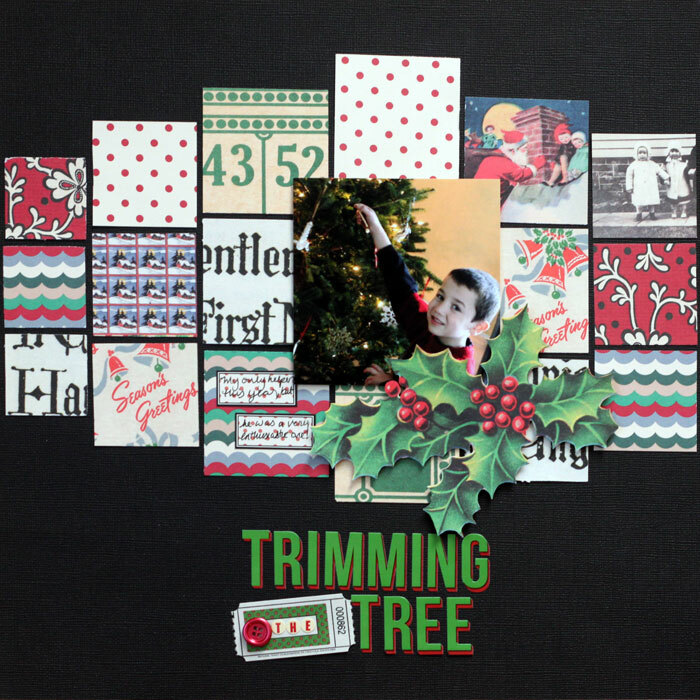 In my layout, I used the larger holly stripe paper as embellishment, cutting out some holly sprigs. I incorporated some older patterned paper into this layout also - it all works together so easily. Next I made some boxes to hold gift cards - the heavier-weight cardstock was particularly helpful here. Can you see yourself using this line? Be sure to let us know! Wow, your projects are great from this collection. Your gift card boxes are so cute. Just love them. Thanks for sharing. Yes, I would definitely use this line of products. 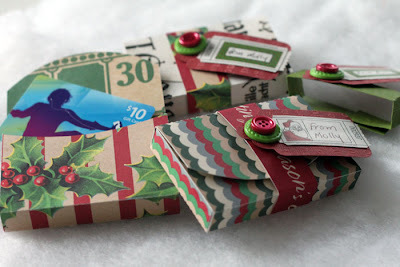 Cute layout...I love Jenni Bowlin products...her die-cuts are the best. Your card and gift boxes are adorable. 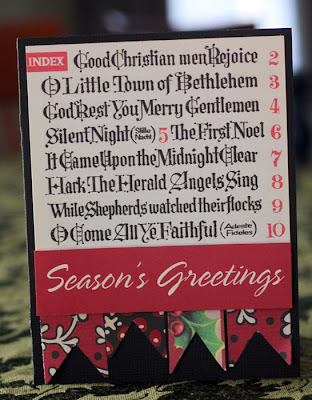 I really like that sheet of Christmas carols...a little bit different than a sheet of music. What a grogeous collection! I could definately get some use out of this!!! love the rustic feel of the collection. i really like how you were able to showcase all of the papers in your layout. the gift card boxes are amazing too! Oh my gosh, that LO is so fab using the different squares of papers...so clever! I looove this paper...I attended a Debby Schuh class and we used these papers...did I say I looove them? Thanks for the inspiration! I think this is a fabulous collection!! Gorgeous work with Jenni's products! I'm a huge fan of of kits and products and could definitly see myself using this line especially in my December Daily album! Great collection and you used it incredibly well. I love everything you created, truly! Cute collection. Anything JB is always a fave for me. Love the style of her papers.